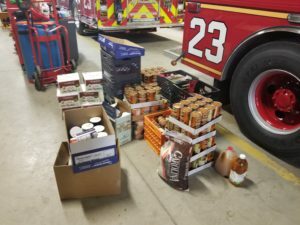 Upper Allen Fire Department » Blog Archive » Annual Food Drive to help Community for Thanksgiving!!!! Annual Food Drive to help Community for Thanksgiving!!!! 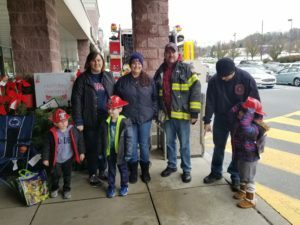 UAFD held our 9th annual food drive at 2 local grocery stores. This food drive is to support Operation Wildcat and the Mechanicsburg School District. Members worked at both Weis Market and Giant Foods to collect food items. A total of 48 boxes of food were collected and donated. 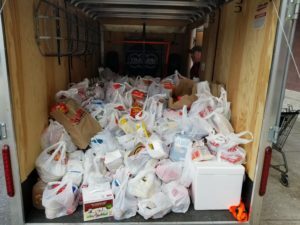 This was one of the biggest amounts of food collected. 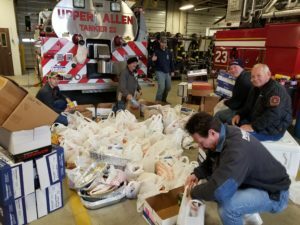 Thank you Upper Allen Township residence that supports the Fire Department! Thank you to the members that came out to collect and sort all the food. 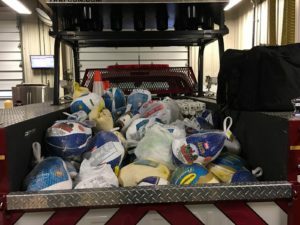 During the food drive on Sunday, we collected 81 Turkeys. They were either frozen, fresh and certificates. It was awesome to see the support that we received! Nice Job UAFD!!!! We donated them to Operation Wildcat (7), Bethesda Mission (57) and New Hope Ministries (17). This entry was posted on Monday, November 19th, 2018 at 11:35 pm. You can follow any responses to this entry through the RSS 2.0 feed.